U.S. Environmental Protection Agency. Adapted with permission. 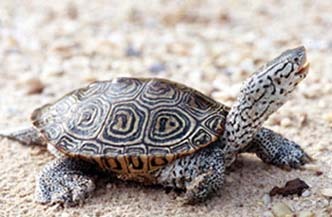 The diamondback terrapin (Malaclemys terrapin)is the only North American turtle fully adapted to life in brackish water (mix of saltwater and freshwater). Its home is in coastal salt marshes of estuaries along the Atlantic and Gulf coasts of the United States. Although they can live 40 years or more, most turtles do not make it to their first birthday, because they are prey for foxes, otters, raccoons, skunks, and birds. If they do survive, females begin to reproduce relatively late—between the ages of eight and 13. This combination (high rates of death for young turtles and long wait until females reproduce) reduces the terrapin population’s ability to increase quickly. Other factors that reduce the terrapin’s survival rates include sea level rise and land subsidence, combined with human dwellings and roadways along the shoreline, and sea walls and other structures built to protect them. These factors contribute to the loss of tidal marsh habitat and the safe haven they provide for nesting and reproduction. In the bottom of each box, work in teams to shape the clay to model a landscape similar to the diamondback terrapin’s habitat: a very gradual slope (long and nearly flat) from a sand dune down to a beach, then a gentle slope that will be under water. To create a model of what the terrapins’ habitat looked like before people came, put about 2 cm of water in the low part of the clay landscape to create the estuarine bay. Use grass clippings to represent a marsh area along the shore; peas to represent terrapins in the marsh; rice grains to represent the crabs, insects, fish, and carrion that terrapins eat; sand along the beach for nesting; tiny scraps of fake fur on land to represent foxes, and small feathers to represent gulls. Role-play a female turtle laying eggs on shore and predators threatening the babies. Put green cake décor sprinkles (babies) in a nest of sand on shore. Two in your group model the babies hatching and “rushing” to the relative safety of water by moving the green cake décors with tweezers. One person holds the fur to model the behavior of foxes; another person holds the feathers to model sea gulls and, using tweezers, both grab at the babies as they emerge from the nest to try to make it to safety. Now have “people” move into the area. Use small objects to represent homes along the shore, toothpicks to represent people, and noodles as boats in the water. Add a small amount of water to models to simulate rising sea level. How much land is now underwater? What is the effect on shoreline terrapin nesting grounds and human structures? Write observations. Use wooden craft sticks to create sea walls to protect your houses in the model. Then add more water to represent rising sea level. What does it mean to adults to lose investment in homes and property? What is the effect of seawalls on the terrapins, including nesting areas and food sources?